In the Taliban years, music – once a thriving and rich part of Afghan culture, admired around the world – had all but disappeared. About 70% of the young people at the institute come from disadvantaged backgrounds – some used to work the streets selling vegetables, plastic bags or chewing gum to support their families. Ages range from 12 to around 20. “One of our students told me we needed a group of four or five girls to play pop music,” he says. “I liked the idea but almost at once it became clear most of the girls at ANIM wanted to join. Suddenly we were talking about a full orchestra. The orchestra was named Zohra after a Persian goddess of music. Dr Sarmast is delighted it’s making a name for itself elsewhere. “But above all it sends a message of gender equality to other Afghans. There are around 100 female students at ANIM, 23 of whom have come to Britain. Their numbers will be doubled when they play in concert with the London -based Orchestra of St John’s and others. Instruments they’ve brought with them include the sarod, the rubab, tabla drums and the dutar. 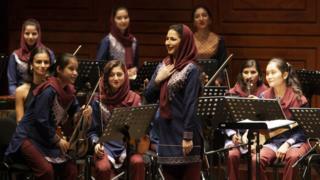 The conductor for the Afghan pieces is Negin Khpalwak, who at 22 is one of the older musicians in the group. She joined the school not long after it opened – not initially with the idea of conducting at all. As a chorister, she performed in Dubai and has also played and conducted in the US, India, Germany and Switzerland. “It’s much easier for me to conduct when we play Afghan music,” she says. “We’re very familiar with it and we play together easily. The ensemble’s highest-profile concert in the UK will be at the British Museum on Friday. But there are other events too before they head home. Cayenna Ponchione-Bailey of the Orchestra of St John’s has arranged for University of Oxford students to mentor young musicians in Kabul – which until now has mainly been by Skype. “What I love about Zohra is that in some ways it’s like a traditional Western chamber orchestra – but also we have these marvellous Afghan instruments embedded,” she says. “There are many things which music can achieve – and empowerment is definitely one of them. In Afghanistan, women’s education continues to be precarious. Negin Khpalwak says even in Kabul, students can still sometimes encounter people beyond the school who think it’s wrong that the orchestra even exists. “They will say that in Islam women aren’t allowed to go to school, not just for music but to study anything. But it’s not true – women have their own rights and those people need to be educated.